Many people have become very rich in the commodity markets. It is one of a few investment areas where an individual with limited capital can make extraordinary profits in a relatively short period of time. For example, Richard Dennis borrowed $1,600 and turned it into a $200 million fortune in about ten years. Nevertheless, because most people lose money, commodity trading has a bad reputation as being too risky for the average individual. 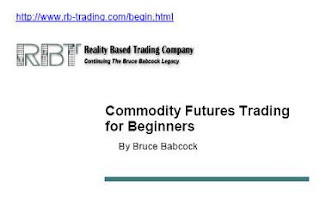 The truth is that commodity trading is only as risky as you want to make it. Those who treat trading as a get-rich-quick scheme are likely to lose because they have to take big risks. If you act prudently, treat your trading like a business instead of a giant gambling casino and are willing to settle for a reasonable return, the risks are acceptable. The probability of success is excellent.